Here on my blog, I think what I favor is pretty obvious. I try to keep a variety of recipes, using different ingredients and flavors, borrowing from different cultures, etc. But sometimes you just can’t fight what you love. My key lime pie is a long time favorite among family and friends. My key lime cupcakes are the most popular item on this blog, so I guess they’re a huge favorite among all of you 🙂 So, what would be better than incorporating this deliciousness into a summer favorite? Not much. Combine first 5 ingredients, stirring with a whisk. Pour into ice cream maker and freeze according to manufacturers’ instructions. Transfer to a freezer container, stir in graham crackers crumbs and freeze for at least an hour. 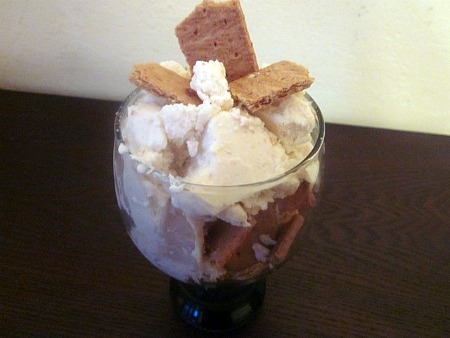 Top with graham crackers (and/or crumbs) before serving. This entry was posted in dessert, freezer friendly, ice cream, lime. Bookmark the permalink. I think I’m loving this, too. It’s so true that no matter how much you try to mix things up, the favorite types of food always show through. I think it’s a great thing, because you love it for a reason, right? Key lime pie is a favorite here too. I probably shouldn’t eat it on one of my “diet” days, but I’m definitely going to try it on one of my cheat days! Oh heavens, my waist size just expanded thinking about this. Yum! key lime is a favorite of mine.Seeing this ice cream is making me crave it! I love key lime but, have never had ice cream. Need to chill the bowl of my ice cream maker tonight!